Most attendees of GOMSWG meetings are individuals and organizations actively engaged in managing or studying Gulf of Maine seabirds, although there are no formal requirements to participate. Regular attendees include representatives from the Canadian Wildlife Service, College of the Atlantic, Maine Audubon Society, Maine Coast Heritage Trust, Maine Department of Inland Fisheries and Wildlife (MDIFW), National Audubon Society, University of New Brunswick, the University of Maine, and U.S. Fish and Wildlife Service. Contact information for many meeting attendees can be found on the Links page of this website. Many species of colonial nesting seabirds were largely extirpated from Maine in the late 1800s due to over-exploitation. Seabirds and their eggs were used for food and bait and some species were harvested to provide feathers for the growing millinery trade. When these activities were halted with the passage of the Migratory Bird Treaty Act of 1918, seabirds in Maine began to recover. Some species have recovered more quickly than others. As a result of open landfills, gull populations in Maine increased from 10,000 pairs in the early 1900's to 100,000 pairs in the late 1970's. Herring and black-backed gulls are effective predators of tern eggs and young and their presence can lead to complete nesting failure or island abandonment by many species of seabirds. It was clear to wildlife managers and biologists that management was required to ensure the recovery of all seabird species in the Gulf of Maine. 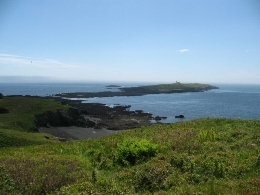 Biologists met to discuss the recovery of terns in 1977 and drafted a plan that included population objectives, research needs, and management strategies. 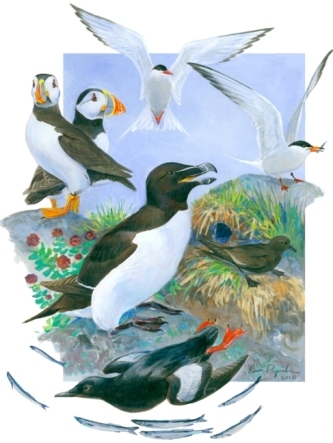 This group began to meet regulary and became the current Gulf of Maine Seabird Working Group. Through the cooperative efforts of the Gulf of Maine Seabird Working Group, diverse seabird colonies have been restored on a number of islands.